I was voted class “worrywart” by my peers in high school. I admit that label suits me well. Back then I worried about homework, tests and boys. Fast forward to adulthood and I still worry but about different things. It shouldn’t come as a surprise that my anxiety greatly increased when I became a mom for the first time. I worried constantly about my daughter. Was she hungry, happy, safe, and most of all why is she so quiet? I remember one of my biggest fears was leaving her alone in her crib for the night. I was constantly sneaking into room and listening to see if she was still breathing. Talk about stress! That should have been the time when I was relaxing and getting rest, but instead I was on high alert. I wish that I had the Levana Oma Movement Monitor back then. I would have felt much more at ease letting my baby rest peacefully in her crib and would have prevented waking her up inadvertently like I’ve done so many times in the past. I was only recently introduced to Levana and was impressed by their commitment to baby safety. They offer high-tech, stylish and reliable baby video, audio and movement monitors to give parents peace of mind knowing their child is safe. I also like that Levana manufactures baby monitors exclusively so that can give their complete focus on making a high-quality product to meet parents’ needs. 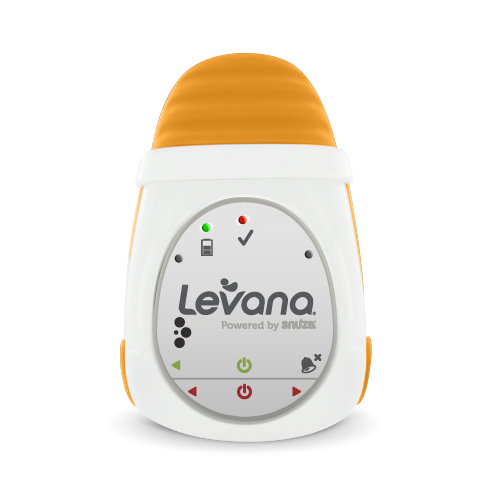 The Levana Oma Movement Monitor is brilliant! 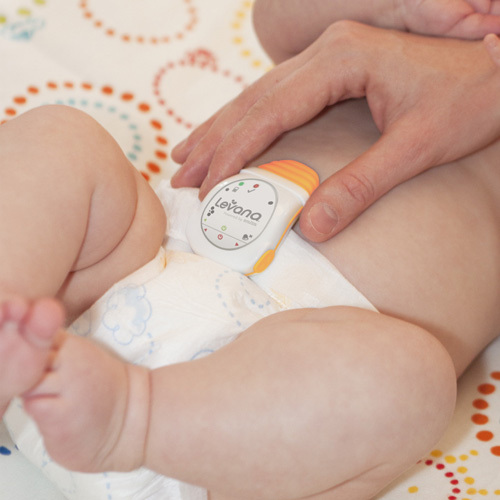 It clips onto your baby’s diaper at the front so the soft, flexible sensor is resting on baby’s stomach. Press the button to turn it on and it will alert you with a loud beep if there is no movement for more than 15 seconds. Then if the alarm sounds, you’ll know to go in and check on your baby. It’s also less likely to give you a false alarm like under-the-mattress monitors can. 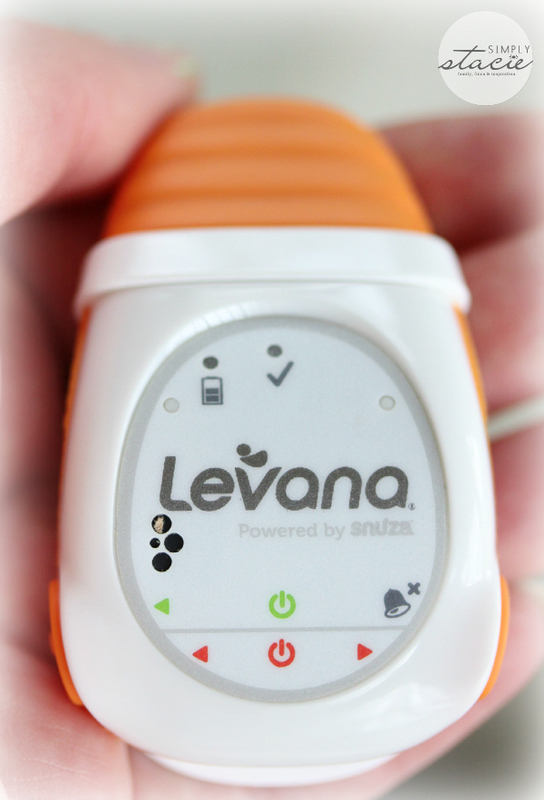 Like all Levana Movement monitors, the Oma Movement Monitor is digital and wireless so there’s no risk of cord strangulation. You can use it in cribs, playpens, bassinets, etc. Plus, it’s portable and compact. If you’re going out for the day to a relatives or friend’s house, just place the Oma Movement Monitor in its carrying case and pop into a side pouch of your diaper bag. You can bring it with you where ever baby goes. It’s battery operated so no need to lug cords or find an outlet for it to work. Watch this video to see the Oma Movement Monitor in action. Big things come in small packages and the Oma Movement Monitor is small in size, but big on benefits. There’s two things you can never put a price on: your baby’s well-being and your own peace of mind. With the Oma Movement Monitor, you can breathe easier knowing your baby is safe. I know I’d definitely be sleeping better without the constant barrage of worried thoughts in my head about my baby. I wish this product had been around when my girls were infants. With the Oma Movement Monitor keeping watch over my baby, I know the #1 thing I’d be doing….sleeping! I longed for a deep, peaceful sleep in those early days. The Oma Movement Monitor is now available at Walmart Canada starting today! It would make a wonderful shower gift for any new mom. In fact, I have some cousins who are expecting and I know just what I am buying them for their new bundle of joy!